In 1853, Stowe traveled to England on a book tour and was well received by the people there. Uncle Tom’s Cabin continues to be one of the most widely read books in the world. 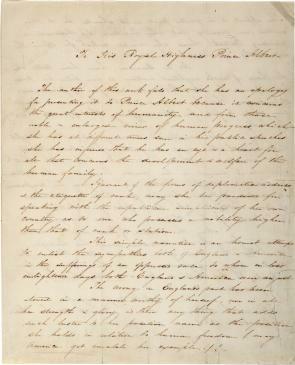 The author of this work feels that she has an apology for presenting it to Prince Albert because it concerns the great interests of humanity and from those noble & enlarged views of human progress, which she has at different times seen in his public speeches she has inferred that he has an eye & a heart for all that concerns the development & welfare of the human family. Ignorant of the forms of diplomatic address & the etiquette of rank, may she be pardoned for speaking with the republican simplicity of her own country as to one who possesses a nobility higher than that of rank or station. This simple narrative is an honest attempt to enlist the sympathies both of England & America in the sufferings of an oppressed race, to whom in less enlightened days both England & America were unjust. The appeal is in greater part as it should be to the writer’s own country, but when fugitives by thousands are crouding British shores she would enlist for them the sympathy of British hearts. We, in America, have been told that the throne of Earth’s mightiest nation is now filled by One less adorned by all this world can give of power and splendour, than by a good & noble heart – a heart ever ready to feel for the suffering the oppressed and the lowly. The author is encouraged by the thought that beneath the royal insignia of England throbs that woman’s & mother’s heart. May she ask that He who is nearest to her would present to her notice this simple story. Should it win from her compassionate nature, pitying thoughts for those multitudes of poor outcasts who have fled for shelter to the shadow of her throne, – it were enough.